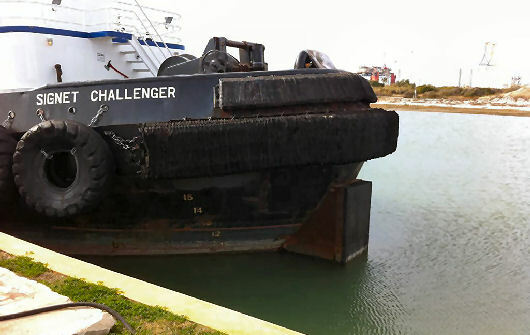 In December 2010, the harbor tug SIGNET CHALLENGER was outfitted with a temporary push knee in support of a tow-out of a large production platform. Argonautics Marine Engineering, Inc. was hired to design the push knee with only short notice. Based on the maximum anticipated push loads, the push knee was designed and detailed shop drawings and installation procedures were provided. A FE analysis of the steel push knee structure demonstrated its suitability. Photographs courtesy of Signet Maritime. FE analysis of the steel structure.